Taryn Christy earns ALL-STATE honors in the 800m!! Taryn Christy, a Geneva senior, ran cross country and track for four years, but she never reached the state track meet until this year. She made the most of the experience. 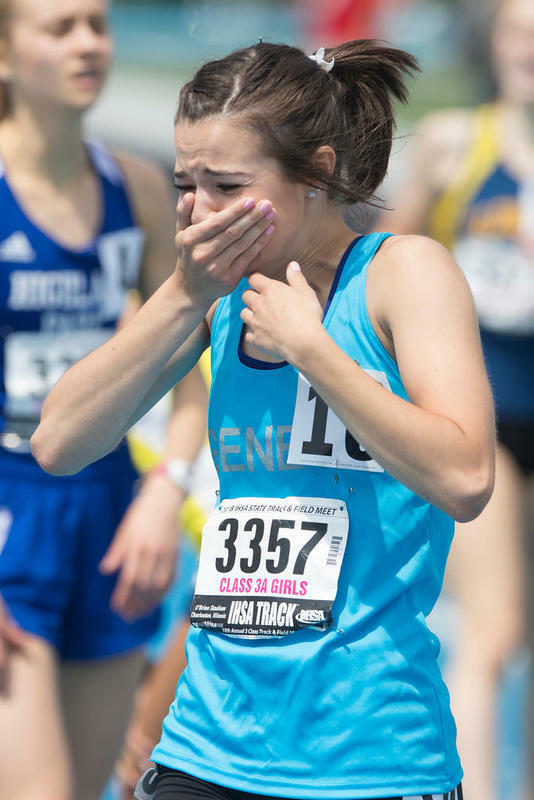 Christy raced to sixth in the Class 3A 800-meter run in a lifetime-best 2:15.05, and was among the Kane County area medalists at the state track and field finals on Saturday at Eastern Illinois University. Christy had the seventh-best seed 800 time in sectionals, but rose to the occasion the last two weeks. She ran 2:16.30 for second at sectionals, and 2:16.47 in Friday’s prelims. She took it to the next level Saturday. “Starting out, that first lap was fast,” Christy said. “I knew that was coming, but I’m not used to running like that. The competition level is so high up. I tried to make a move at the third turn. I kept thinking, these are the last two laps of my senior year so just give it everything. Christy, who will run track and cross country at Illinois-Springfield, leaves some big footsteps for a young Geneva group.